Nelson's Gourmet Bartender's Secret - Instant Bloody Mary Seasoning. The perfect mix. Nelson's is a secret family blend of 15 herbs and spices. Nelson's Blood Mary Seasoning makes the perfect Bloody Mary. It is easy to use if you're making a single Bloody Mary or a premix for multiple Bloody Marys. Pack a 12 oz glass with ice, add 1oz. premium vodka, rum or dry white wine. Fill the glass with a quality tomato juice. Flavor with 5 to 7 vigorous full shakes of Nelson's Bloody Mary Seasoning. Stir well. Garnish with celery stick and/or a kosher pickle spear. At Nelson's, we believe every Bloody Mary should be as unique as the individual drinking it. We offer this recipe as a guideline. The actual number of shakes will depend on how much spice and flavor you desire. Nelson's Bloody Mary Seasoning is a great addition to any cook's spice rack. 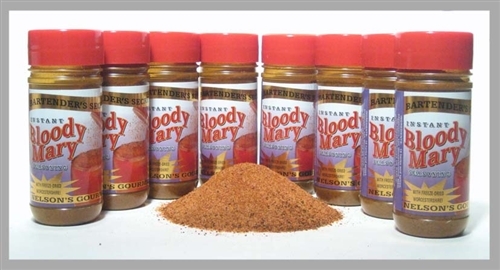 Nelson's Bloody Mary Seasoning is great on fish, chicken and steak. It adds extra flavor to chili, sloppy joes, tomato sauce, and party mix.